THE DEPRESSION. 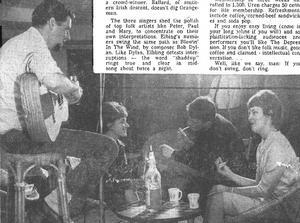 John Uren (with guitar) entertains at The Depression while (left to right) Judy Johnson, Radford Robinson and Ricki Skoken soak up atmosphere. If you don't swing, don't ring. The watchword is clear but, despite its faults, Calgary's newest "night club" gets "A" for atmosphere and authenticity. In the murky depths of a 12 Ave. and 1st St. S.W. basement, The Depression coffee house is the product of ex-Torontonian John Uren. It's semi-beat (raffia curtains), Simon Pure (no liquor) and seemingly flat-broke (creaky, ancient chairs). The Depression -- so called to remind patrons there was once a bread line here in the West -- is basically a folk-song hideaway. Owned and operated by Uren, 27, The Depression is open every night except Mondays. Uren, who says he is not an angry young man, admits dislike of "work, Toronto and yacht clubs." Featured performers are Peter Elbling, Joannie Anderson and Floyd Ballard. English-born Elbling is en-route around the world. Joannie Anderson, of Saskatoon, is cute and a crowd-winner. Ballard, of southern Irish descent, doesn't dig Orangemen. The three singers shed the polish of top folk artists like Peter, Paul and Mary, to concentrate on their own interpretations. Elbling's numbers swing the same path as Blowin' in the Wind, by composer Bob Dylan. Like Dylan, Elbling detests interruptions -- the word "shaddup" rings true and clear in midsong about twice a night. "It's here because I want to get to Europe, it's here because I figured Calgary needed a coffee house, and it's here because I like folk music." Mondays, closed; Tuesday, chess; Wednesdays, surprise night; Thursdays, poetry; Fridays and Saturdays, folk music; Sundays, hootennanny. Doors creak open about 9 p.m. -- they close when everyone is gone. Membership in three weeks has rolled to 1,500. Uren charges 50 cents for life membership. Refreshments include coffee, corned-beef sandwiches and soda pop. Well, like we say, man: If you don't swing, don't ring. This article has been viewed 5,668 times since being added on May 12, 2005.